This fun card features the “must have” Stamp-A-Ma-Jig stamp positioning tool! Change the colors and sentiment to suit your needs. My card uses the Work of Art stamp set in wood mount (chevron image) and the clear mount version of the For All Things stamp set. Also, I use Burlap Ribbon every chance I get, so of course I included it on this card! 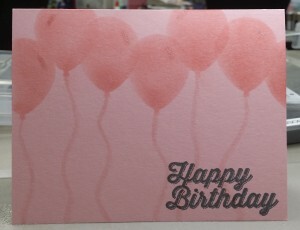 Depending on the colors and embellishments you add to YOUR card, this could be masculine or feminine. So versatile! I hope you enjoy this video – make sure to subscribe to my YouTube channel if you haven’t already. In this MDS quick tip video, I’m answering a viewer question about changing background papers on a pre-designed template. She wanted to make sure that she could change some of the background papers in this calendar template. This info applies to any pre-designed projects by Stampin’ Up! You can feel confident in purchasing a template you like, knowing you can change virtually anything you’d want to suit your needs and style! Watch for more videos using this same calendar template! Be sure to subscribe to my YouTube channel so you don’t miss anything.